Bank of America will distribute $120,000 in grants to eight nonprofit organizations working to increase access to affordable housing and supporting neighborhood revitalization. Funding will help low-income residents struggling due to a lack of affordable housing and enable them to access the resources they need to lay a foundation for a stable financial life. Among the nonprofits receiving grants is the Consumer Credit Counseling Service of Southern Nevada, which will use the funding to support its A Home of My Own program, providing participants with first-time homebuyer counseling to stimulate financial health and growth. Additional organizations receiving grants are Habitat For Humanity Las Vegas, the Las Vegas Natural History Museum, Nevada HAND, Rebuilding Together Southern Nevada, Safe Nest, United States Veterans Initiative and Women’s Development Center Inc. In 2015, the Bank of America Charitable Foundation gave more than $2 million back to the community in the form of grants and partnerships. Additionally, local employees volunteered more than 10,000 hours in Southern Nevada. Project 150 held a Free Teen Shopping Day in August at Betty’s Boutique in the Brady Caipa Volunteer Center to benefit the more than 2,500 homeless high school students in the valley who are without the basic necessities. Students with a high school ID shopped for new and gently used clothing, shoes and socks, accessories and school supplies. Project 150 is in constant need of volunteers to process donations and assist student shoppers in Betty’s Boutique, which is open throughout the school year. The charity serves more than 2,500 homeless, displaced and disadvantaged high school students in 47 high schools throughout Clark County. Jonathan Schwartz, director of Yellow Checker Star, announced the company has donated $150,000 of its modified business tax dollars to Dinosaurs &Roses, a nonprofit organization that will use the money to award local scholarships for underprivileged children to attend private schools in Nevada. Assembly Bill No. 165 was signed into law in 2015, establishing the Nevada Educational Choice Scholarship Program, which allows any taxpayer who is required to pay the modified business tax to receive a credit against the tax when donating money to a scholarship organization that has been approved by the Nevada Department of Education. Many local students who are members of a household whose income is not more than 300 percent of the federally designated level signifying poverty have benefited from this bill and the scholarships. 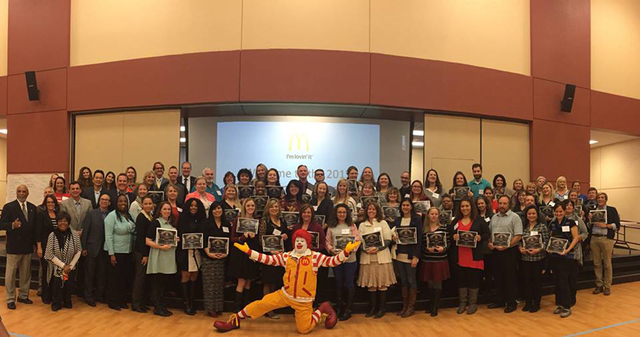 McDonald’s Southern Nevada owners/operators have announced the annual Make Activities Count Grant program call for applications. The MAC Grant program provides Southern Nevada K-8 teachers an opportunity to fund an activity that gives students a unique learning experience they may not otherwise be able to fund. Project 150 and Life Is Beautiful will host Hands on Ideas Sept. 9, a day when Clark High School is beautiful for more than 3,000 students. The day’s activities will feature guest speakers, chef demonstrations by Panacea, plays by the Nevada Shakespeare Institute, yoga sessions, a drum circle presented by Community Productions, live performances and more. Motivational speakers, including Dray Gardner, chief operating officer of Making a Difference Enterprises, and John McNichol with Regular Hero, will give students an inside look into what it takes to succeed. Students will help create inspirational murals on the school walls with Chase Carter with Right at Home; Gabe Gault with MM Productions; Las Vegas artist, the Stencil Artista; and Southern California artists John McNichol and Phenomenal Mark, in an effort to instill the message that each and every student has the power to succeed. Each student will also participate in a contest to create a mural of what they think is beautiful, which will be judged by the attending artists. The winning entry will be created by the artists and put on display. For more information, visit lifeisbeautiful.com. Pamela Sukhum Artist Exhibition and Reception will begin with Big Brothers Big Sisters 1 to 3 p.m. Sept. 24, at Centaur Gallery, 4345 Dean Martin Drive, Suite 200. Sukhum will create an original painting and lead an interactive workshop with children and their mentors from Big Brothers Big Sisters of Southern Nevada. Following from 5 to 9 p.m. is the Centaur Gallery reception/presentation, A Painting Comes to Life. Sukhum will create an original painting and greet charitable supporters and clients. Sukhum’s work is fueled by spiritual and human connections forged during her journeys around the globe, from the monasteries of Tibet to the refugee camps of eastern Chad. To RSVP, contact 702-737-1234 or email travis.walters@centaurgalleries.com. For more information, visit centaurgalleries.com. Treasure Island employees collected thousands of school supplies for the low-income children served by the Volunteers in Medicine Ruffin Family Clinic, which offers free medical care, basic testing, medications, and vision and dental for uninsured individuals and their families. Treasure Island donated 300 backpacks, which were stuffed with the supplies and delivered to the clinic Aug. 24.